It is understood that Milan boss Gennaro Gattuso is looking to bolster his midfield options and has identified the Brazilian midfielder as a potential signing during the winter transfer period. AC Milan are interested in securing the services of Fabinho from Liverpool when the transfer window reopens in January. The 25-year-old has made a slow start to his life in Merseyside after making a switch from AS Monaco in a deal worth £39m earlier this year. The Campinas born prospect finally made his debut for Liverpool last month and put in a few excellent displays, most notably against Red Star Belgrade at Anfield in the UEFA Champions League when he completely ran the show in midfield. The Liverpool fans have already seen glimpses of his brilliance on the pitch, but they would need to be patient to see Fabinho playing at his best. It will take some time for the Brazilian talent to adapt his game to the physicality and high intensity of the Premier League. The Liverpool sensation is a strong presence in midfield and has the ability to time his tackles to perfection and win possession back for his team. The Brazilian midfielder is not afraid to make his presence felt and is always looking to work his socks off at the center of the pitch. 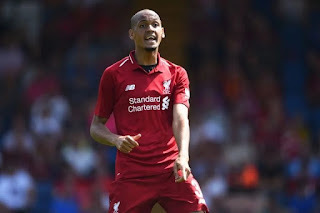 Despite not being as good on the ball as some of his other teammates, Fabinho still offers his own unique set of defensive skills which would be a crucial asset for Klopp as he looks to find a way to beat Manchester City to the Premier League title. There is no reason why Klopp should part ways with his prized asset in January so soon after his arrival in England. It seems like a story to fill the papers so the Kopites all around the world shouldn’t be too worried about Fabinho’s immediate future at Liverpool.